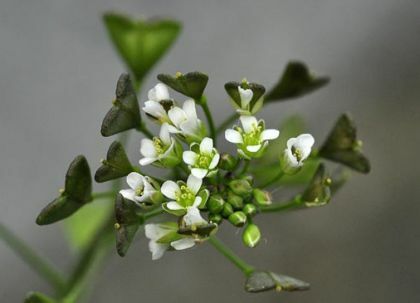 Shepherd's-purse is not easily confused with other wild plants on this web site. All-year round this little annual wildflower can be found growing in gardens, on tracks, cracks in pavements and on arable land. 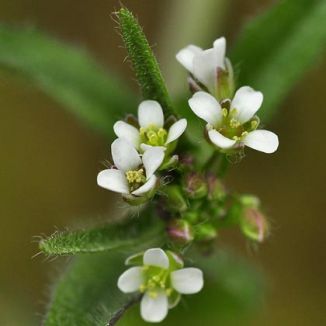 Its 4-petalled white flowers (2-3mm across) are borne in terminal clusters on stiff stalks rising to about 35cm from a basal rosette. The lanceolate leaves vary from lobed to entire. It is easily distinguished from other members of the family Brassicaceae by its distinctive seedpods which are green and triangular with a notch at the top giving it a heart-shape. This is a native plant which is widespread throughout Ireland. Used by 17th century apothecary and herbalist, Nicholas Culpeper, who recommended that 'the juice being dropped into the ears, heals the pains, noise and mutterings thereof'.